Welcome to Happy Mail Challenge 4: Tie some twine on your Happy Mail card and send it to someone you love (click here to read about Happy Mail). Come play with us and link up your own creations of incorporating TWINE into your Happy Mail over on BPC website. Here's some ideas on what you could create. Now you do not "have to" knit your twine like Melinda did, but WOW this is one way of incorporating twine on your Happy Mail!! 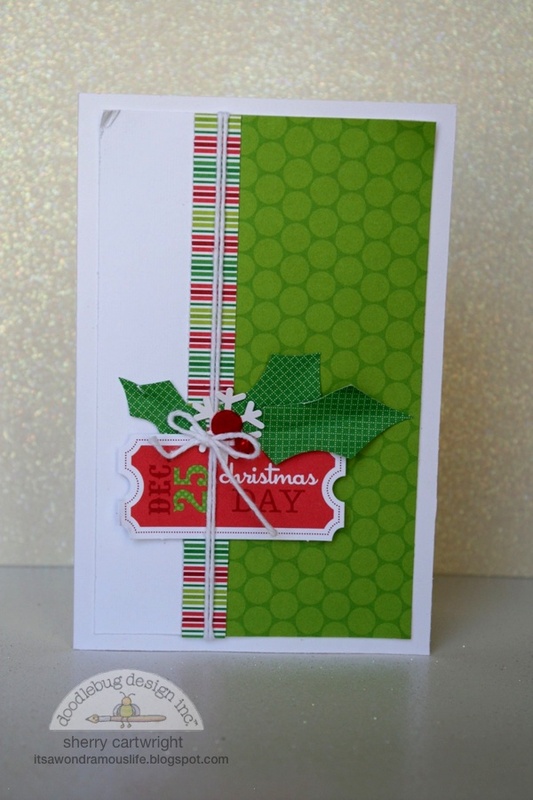 Use it to accent around an opening to your card. Sherry Cartwright created this fun holiday Happy Mail and told us, "I love sending and receiving something fun in the mail. Bills or advertisements just don't cut it. So, this year, I started sending some happy mail [a la Stacy Julian, Big Picture Classes and Doodlebug Design]. I used the Happy Mail challenge 4 -- tie it up with twine! as a starting point for this card. I used white doodle twine and tied it in a simple bow. Nothing fancy, but still delightful." 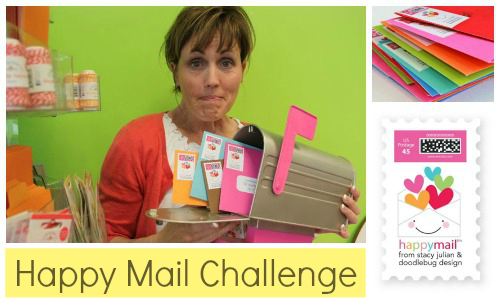 Go take the challenge and send some happy mail! These are all fantastic but that knitting by Melinda is unbelievably cool! Melinda --- wowWOWWOW! That is so very beautiful and clever and I LOVE the little sentiment. For all the great inspiration !!! Awesome twine projects!!! I am in awe of the knitted twine - what a fabulous idea! 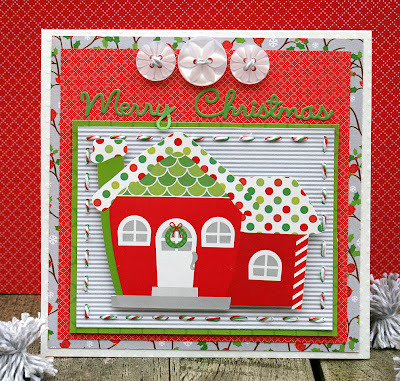 Great idea and love the twine, cards! Makes me want to pick up knitting, now, just to make that card!! LOL! WOW!!!! Sherry and Melinda awesome! Melinda -- love your adorable scarf!!! That's crazy cool! Really great projects ladies! Great projects! Melinda - your knitting piece is amazing!! That little knit scarf is AWESOME! I wish I could knit even more know, thank u for your colorful inspiration! Melinda's idea is amazing! LOVE the knitted twine. Every sample looks great, but Melinda totally steals the show! 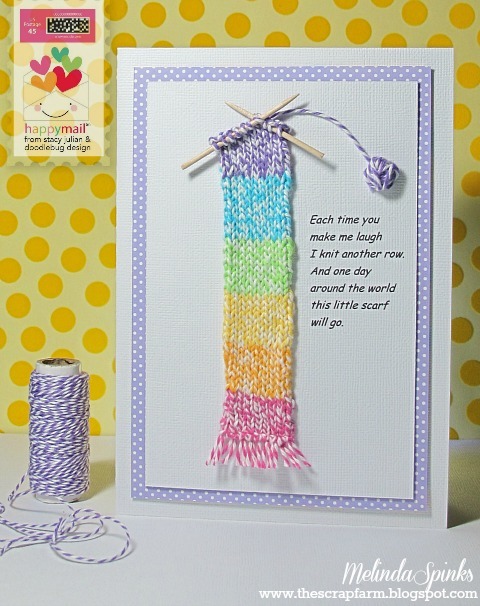 Fantastic card - so clever knitting a scarf for the card and the sentiment is the best! More Squishy Cute Pumpkin Ideas! Happy Mail Challenge 3: Distress It!